Rain gutters are probably something you don’t think about too often but are essential to the overall protection and safety of your home, so we think it’s worth giving them some thought. Without a rain gutter, water from rain and snow would just pour off your roof and fall at the base of your home’s foundation potentially causing erosion or leaks. Hence, when leaves and other debris aren’t cleaned out of your gutters at least twice per year, water can fall over the sides of the roof or even get backed up and cause damage to your roof shingles leading to leaks that could seep through to your home’s interior. Of course that would then lead to an unplanned home interior remodel. 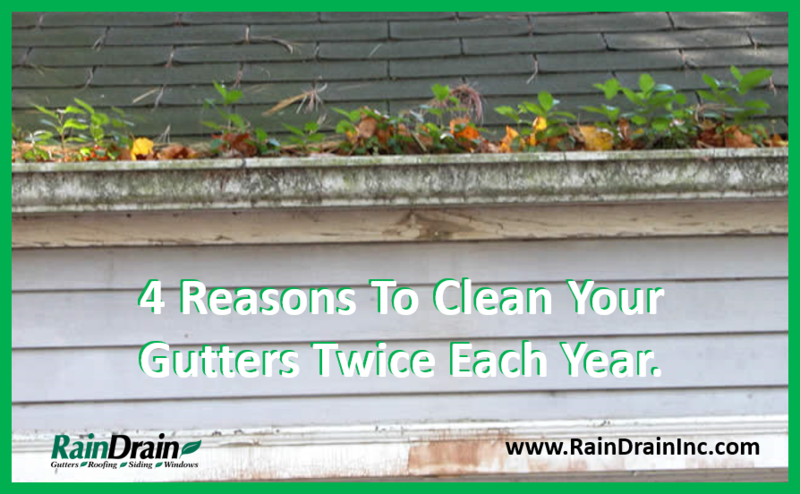 In this post, we’ll break down all the reasons we think it’s important to keep your gutters clean year-round. In fact, we’ll even let you know how several top-rated gutter cleaning services can help, so if you’re already headed to the garage to grab that ladder, you may want to hold off. Gutters do an important job, directing water away from the perimeter of your house. If your gutters are clogged with debris or not in operative shape, however, they may not function properly. Regular maintenance may help keep your gutters functioning properly, prevent water damage and keep your home looking nice. Usually it’s apparent when there’s a clog in your rain gutter because you’ll see a giant puddle near the base of your home, or leaves growing out of your gutter. However, it’s still important to have them checked regularly to catch any early signs of clogging when it is not so apparent. The faster you can catch a clog, the better because not taking care of the problem could result in damage to your basement, the siding, the windows, the roof, and if left untreated long enough — your homes interior. Plus, if that water starts to leak into your home foundation. You’ll get mold, and that moldy smell is hard to get rid of once it’s there. So it’s smart to take preventative action now. Avoiding gutter cleaning can put your home at serious risk for a variety of issues. Clogged gutters may cause all kinds of issues with your home. Water damage: Properly functioning gutters and downspouts direct water away from the structure of your home, says the Insurance Information Institute (III). But, clogged gutters and downspouts may potentially cause water to collect around your foundation and, as a result, get into your basement. When rainwater backs up inside of your gutters it can fall down the side of your home and begin seeping into your basement causing a flood. Roofing damage: Standing water can be backed up onto your roof, making your gutters detach from your home. Not only will your gutters be damaged, but this creates weak shingles causing the fascia and soffit to rot. Other damage: Other areas at risk are your foundation, driveway and landscaping. Check for Repairs: Having your rain gutters cleaned is also necessary to making sure that all needed repairs are taken care of before unnecessary (and costly) damage is caused to your home. During winter, a lot of weight from snow and ice can really hurt your rain gutter so making sure it’s in tip-top shape now is critical. A bent rain gutter can eventually break, dumping water onto your foundation leading to all kinds of water damage problems. According to BobVila.com, the weight of water, twigs and other debris may loosen gutters and cause them to pull away from their attachments. This may lead to your siding and trim rotting. Ice dams: In Northern Indiana and Southern Michigan freezing temperatures are a common occurrence during winter, your clogged gutters may cause ice dams. An ice dam is when water flows over the edges of a clogged gutter and then freezes, potentially forcing water into your home. Ice dams can also become so heavy they may rip the gutter right off your home, resulting in costly repair bills, says BobVila.com. Critters / Vermin: If you have excess water sitting in your rain gutter due to clogs, you also risk attracting pests such as termites and mosquitoes. These bugs thrive in water and a neglected rain gutter can double as the perfect home for these pests. In addition, critters such as birds, bees, opossums and rodents like to use gutters as their home since they become a cozy environment when clogged with leaves and water. You may be inviting other pests such as mice and birds to camp out in your attic if you have excess moisture and if you’ve ever dealt with animals trapped in your attic before, you know it’s not fun getting rid of them. And, if these pests are living in your gutters, there’s a chance they might make their way into your home. Mold: When your gutters are not properly equipped to handle the flow of rainwater, water may seep into areas that meant to stay dry. Mold can them begin to form in your basement or attic causing serious damage or health concerns for your family. Desert: If you live in a hot, dry desert, or in an area without any foliage or plants near your home, you may only need to clean your gutters once a year, says the Arizona Republic. Woods: If your house is surrounded by lots of trees, your gutters may need cleaning three to four times a year, says Angie’s List. Snow and ice: If you have snow on your roof and notice any ice dams, it may be too slippery and dangerous for you to attempt to remove ice dams yourself. It’s a good idea to contact a professional who has experience and the appropriate equipment. Remember, you should always defer to the advice of a professional on the right plan for your home to help make sure your gutters are cleaned often enough. Since cleaning your gutters requires you to get on a ladder, it’s always safest to leave this job to a professional. There are many companies that specialize in gutter cleaning. These professionals have the knowledge and training to safely clean your gutters and downspouts and can typically check for and repair misalignment, leaks or damage. Gloves: Hand protection is critical due to the possibility of sharp objects in the gutter. Dust mask: Dried, clogged gutters can be very dusty, and you don’t want to breathe in this dust. Safety goggles: Debris may fly back at you when cleaning, so wearing safety goggles to help protect your eyes is a must. Ladder and spotter: A ladder is typically needed to access the gutters, and you should always have someone nearby to hold the ladder for you. Garden trowel: It can be used to scoop the debris out of the gutter. Keep in mind that some debris may be stuck, and it may take some effort to remove it. Be careful not to damage the gutter. After the larger debris is removed, use a garden hose to wash out the remaining dirt, says BobVila.com. Taking some time to focus on cleaning out your gutters may help keep water out and prevent damage to your home. Proper gutter maintenance can be vital to defending your property from water. As mentioned above, gutter cleaning can become costly and cause serious damage if not taken care of semi-annually. Now that you know why it’s important to keep you rain gutters clean, the question is to do it yourself or to leave it to a professional? We say leave it to the professional because we care about your safety and trying to clean or repair rain gutters yourself can be dangerous, especially if conditions are slick. A professional is also trained to do a thorough job and spot any potential issues that may otherwise go unnoticed. Instead of continuously paying someone to clean your gutters or risking falling off a ladder by doing it yourself, you need reliable gutter protection. That is where the LeafGuard Gutter System comes in. LeafGuards’ micro mesh gutter guard attaches to your existing gutters without disturbing your shingles or roof warranty. The micro mesh will not rust or corrode and is 50 microns fine, so nothing but water will enter your gutters. With LeafGuard there is no more gutter cleaning needed. 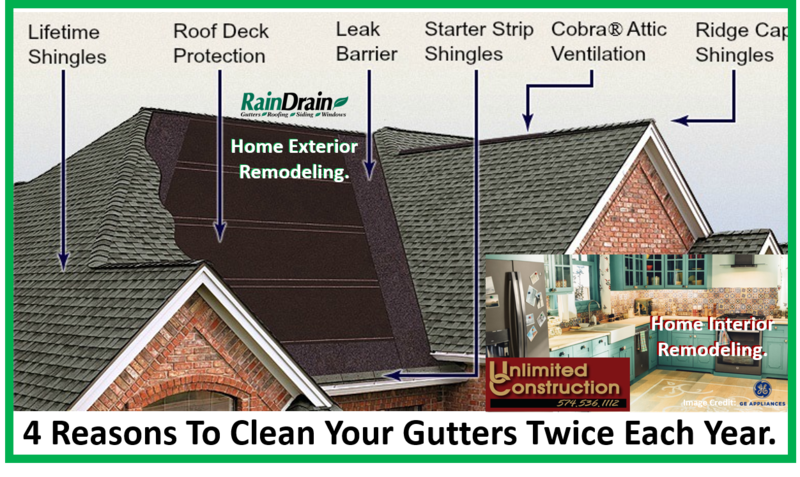 The subtle drip-edge on the front of LeafGuard keeps the front of the gutter clean by diverting leaves, pine needles and other debris over the drip edge while water is pulled through the micro mesh into your gutters. Lastly, we provide homeowners one single point of contact for sales and service allowing to maintain a high level of quality control and service. With a lifetime, transferable warranty from the largest gutter protection company in the United States, LeafGuard is your answer to eliminating gutter cleaning. 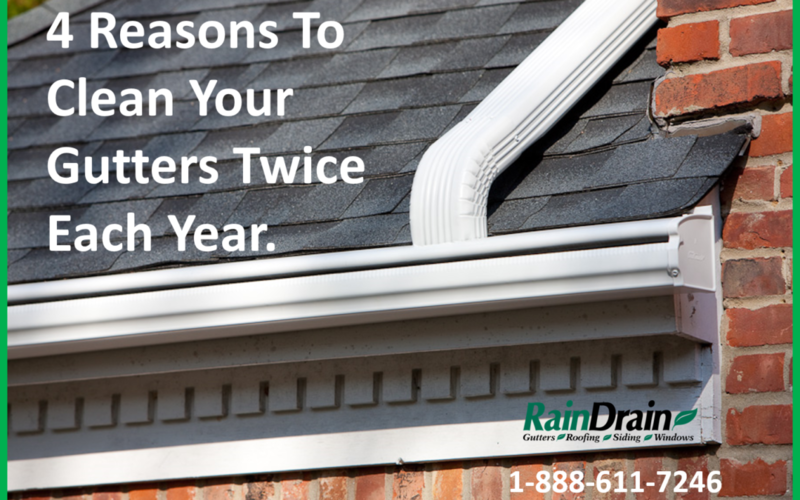 Give RainDrain a call at 1-888-611-7246 and we’d be happy to assign you a trusted contractor to come take care of your rain gutters for you, or request in free estimate online.